This entry was posted on February 7, 2019 by Menzie Chinn. We have to wait another month to get the full year results for 2018 but it does appear that we will have imported more and exported less. Menzie Chinn: Love the short concise blog post title. Top marks for public policy humour! @pgl: Thanks for the link. Took a look. That ratio of imports to exports has hovered around 4 for a long time. It went over 6 in 1999. 2018’s ratio so far is 4.4 which is in line with past years. I agree completely with Menzie Chinn and the NA economics profession in general that trade good balances should not be a public policy objective but wanted to see if there was anything salient that would further excite voting American patriotudos. As far as I can make out, bond markets started losing confidence in the future during the summer of 2018 and now broader equity and financial markets are waiting until early March to see what the China-US trade meetings produce. This President’s bombastic style, threats, disrespect, grotesque insults and various bewildering policy actions must have shaved at least a few basis points off US real economic growth relative to potential. I have no idea to go about estimating that lost opportunity but hopefully others will make the attempt to estimate those losses. Only the bold print and in quotations part quoted verbatim from a footnote in Brad Setser’s blog. As another interesting side note—going clear into the north part of China, (which is where I spent 98% of my time there) you see a decent amount of Filipino girls working certain types of jobs. Certainly more than you would expect. Discuss amongst yourselves. Never let it be said Chinese aren’t the absolute masters of finding the low cost alternative. I understand that an important part of the decline in U.S. exports to China consists of petroleum exports, which might render the chart a bit misleading if it is meant to reflect substantive effects on the U.S. economy or its exports. The video is roughly 4 weeks old. Michael Pettis is discussing income inequality in America. So now Michael Pettis is a dirty “socialist” just like Miss Ocasio-Cortez. Who knew?? 48% of the improvement in the Nov. trade balance stemmed from a sharp drop in oil. Calculated risk has a good chart. I don’t suppose you have any idea why China made the decision to start sourcing more of their oil from Africa do you?? You know Spencer, if your true intended goal on this blog is to provide comedy relief, much similar to PeakIgnorance, you are royally succeeding in doing so. Let me try to explain it for you Spencer, you see, much similar to their decision to source soybeans from Brazil after all of Orange Excrement’s macho talk, they did the same with their oil imports and now buy more from Africa. You see, the Chinese are similar to the Israelis—they look out for themselves in an intelligent manner and they don’t play footsie with shitheads. The non-college white American voter could learn so much from this when they go to the voting booth. So, what will actually losing look like? interesting thought experiment. Not sure if dystopian science fiction or economics is a better starting point. But . . . imagine a world in which, somehow, the exorbitant privilege has either been transferred to another power or become part of the global commons, a future in which the current intellectual property regime is regarded with the same affection and respect that today we accord the plantation economy based on chattel slavery, and a culture in which the offerings of the Asian film industries captivate audiences with their substitute for reality to the same extent that Hollywood’s did in the 20th century. Pretty different. Sic transit gloria . . .
Trump should be praised for confronting problems and trying to correct them rather than sweeping them under the rug and allowing them to go on. Of course, the Trump haters won’t give him any credit. PeakTrader: Like corruption, global climate change/rising sea levels/Zika, continued DPRK nuclear weapons development, Russian cyberwarfare, lead in drinking water, etc. etc. Confronting problems? Seriously? He is creating problems leaving it to others to clean up his mess. 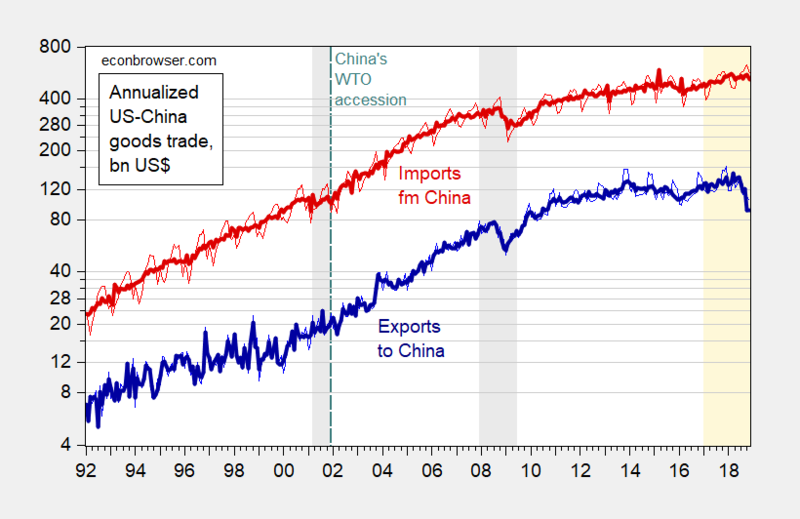 Did you deliberately use a log scale to hide the enormous difference between US exports to and imports from China? Let’s see the same chart with a linear scale that we humans can actually understand. Alun Jones: Let me refer you to a post by an extremely famous economist, who wrote *the* time series econometrics textbook used in the profession. This is actually very useful. I know why we do it, and I know logs are incredibly useful, and have never argued that fact, but to see it broken down in more simplistic detail is useful to me. Thank you for this. I should also say (and this isn’t meant as any kind of a “veiled dig”, more a commentary on my own stupidity) I wasn’t aware Hamilton’s book was the “go to” book. Somehow I had got it screwed up in my mind that Darrell Duffie was the go to guy on a lot of that stuff. That’s what happens when “you” tend to only skim research papers and have only shallow knowledge of some of these things. For non-log depictions, see here.